You are at:Home»Business»What Is The Best Grasshopper Phone Alternative? When To Use A Fully Featured Business VoIP Phone Service Instead Of A Number Forwarding Service Like Grasshopper? So when should a business owner choose a different voip provider than Grasshopper, and what are the best options? So what are the best options compared to Grasshopper? Confused by Grasshopper phone alternatives, and don’t want to get ripped off by “complicated sounding” virtual phone service providers similar to Grasshopper? In this article, I go over the common reasons most users have to switch to another provider, which include needing call recording features, voip office phone hardware, needing to add phone adapters, etc… Maybe you’re already a grasshopper customer, and looking for a business phone system that has more office like features? Or perhaps you’re shopping for a virtual phone system for your business, and you’re just looking around to see if there are any better deals out there on number forwarding services like Grasshopper? No matter your reason, hopefully this quick guide here will help you find the right phone service provider for your needs. I have two favorites when it comes to competitors and similar phone systems, and they are these two VoIP services below. I recommend Grasshopper a lot for most business owners just getting started, or for those who want a cheap business line on their cell phone for mobile service based businesses… But the fact of the matter is, there are a few situations where Grasshopper isn’t the best fit. Specifically, if you want the ability to record your calls, or you want to have a physical voice over ip office desk phone which they do not offer. Phone.com is my top choice is for the best alternative to Grasshopper, mainly because of the price and future expandability. They have the same great low rates for their starter plans, and the free smartphone app just like Grasshopper, but will also allow you to add VOIP phones and hardware at any time if you grow your business to the point of needed multiple lines and office equipment. RingCentral is a favorite among small business owners who want to connect multiple offices, have a multi-line phone system that has an awesome softphone app that will allow employees who work remotely to tap into the business phone system with nothing more than a laptop, and do advanced conference calling like video conference calls. Most of the glorified VoIP providers that will provide an entire pbx phone system tree, will also do lower tired stuff like business phone forwarding on the cheap too. For most people, the Grasshopper phone system works awesome. I even have friends and family who use it successfully, and love it because of how easy it is to setup and the affordable price. But I get it, it might not be for everyone, especially those who are used to a traditional landline phone system. So the nuts and bolts of Grasshopper are mainly a number forwarding service, layered on top of a nice online control panel with custom voicemail creation services and an easy to use interface. Most people are going to be unsatisfied with Grasshopper’s phone service, are those looking to “landline like” setups with features typically only found in an office phone system. Being mainly targeted at virtual phone system customers, grasshopper doesn’t have the ability to let you add phone adapters (so you can connect your old landline phones or voip phones to your new business lines), let you record calls to spot check sales personnel, or do advanced things like video conferencing. 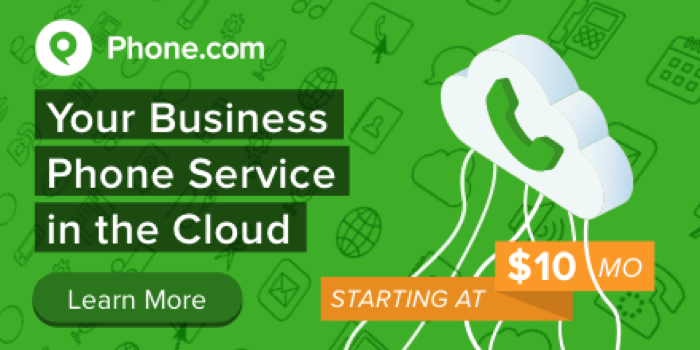 I would recommend you check out Phone.com first, since they have base plans that are very affordable, and give you the ability to expand into a full blown office phone system in the future. You will like the fact that they have a very similar smartphone app, that works just like Grasshopper phone forwarding service. They also have a large inventory of available 800, toll free custom vanity, and local phone numbers you can choose from if you’re unhappy with your original purchase from Grasshopper. Ultimately, we and the service providers just want you to get the best phone service for your needs. I’ve heard of a few other number forwarding services for small business like Mighty Call, Evoice, Talk Route, and Line 2 but I haven’t had a chance to test them all out individually. I can tell from just looking at the phone plan specs on all of those providers that most of them are just number forwarding services just like Grasshopper. I don’t mean that in a bad way, there’s nothing wrong with Grasshopper at all and it works awesome for it’s intended purpose. What I’m getting at is, if you’re already unsatisfied with Grasshopper, you’re probably not going to be happy with any of those other providers I just mentioned either. What you’re looking for is a hybrid between a virtual number service, and a pbx phone system for small business. As I mentioned above, if you want to do fancy call tracking, record your business calls, etc… the companies I recommend the most for those things are Phone.com and Ring Central. Both have their pros and cons, and both have different entry level price points without unlimited minute plans. Update – a lot of people seem to have questions on comparing different virtual number providers when looking for a good Grasshopper replacement. I’ve written a few other guides that may help you if you’re looking for specific things like call tracking, 800 numbers, custom vanity numbers, how to setup your business phone number, getting an 800 number on your cell phone, which cheap business voip providers are good, and inexpensive business phone systems and services. Can I Just Get A Toll Free Number Through Google Voice? There are literally a TON of services like Grasshopper… but I still get a lot of questions about what is a reliable alternative to grasshopper.com for virtual phone numbers for my side business? I still stand by the recommendations above for that, even if it’s just to post ads on Craigslist for your gutter cleaning business on the weekends. I personally would use Grasshopper or Phone.com for that since they’ll both be excellent at adding a low cost 800 or custom vanity number to your cell phone, and protect you and your family from shady people finding out your home address and personal caller id. Either way, one of these two providers will definitely take care of your needs, and I stand by them both… as well as recommend them to friends and family, so you know they’re good!